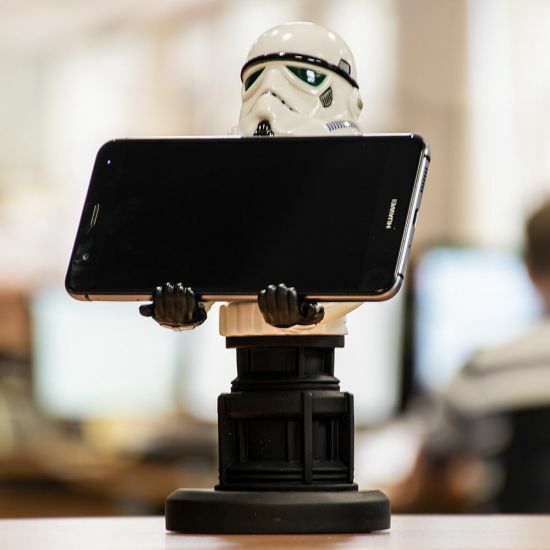 It’s a Stormtrooper phone and controller stand! As the boots on the ground, the Stormtroopers were responsible for upholding Imperial rule across the galaxy. And, now, they’re coming to your room to uphold your console controllers and phone… or, at least one is: this Stormtrooper Cable Guy! An amazing replica of the men (and women, hoping the Empire was diversified) in white armour, this Stormtrooper is 100% officially licensed… and just as awesome! It’s perfectly-designed to hold both PlayStation and Xbox controllers, and can even hold your smartphone while you charge it with the included 3-metre USB cable (with adaptors to fit both micro USB and Apple Lightning). Basically, even though Stormtroopers have a tough time getting their hands on the rebels, this one will have a firm grasp on your tech stuff! Don’t let your stuff lie around until it eventually disappears into a galaxy far, far away. Make sure you have a safe spot to keep your goodies… say, the hands of this Stormtrooper 8” Cable Guy! Buy yours today!